For our Lazarus demonstration we added to the form a CalendarDialog (from the Dialogs tab of components), a label (from the Standard tab) and a StaticText (from the Additional tab). Our code of the files needed for program CalendarDialogDemo follows. You can copy the code if necessary, but a you should be able to adapt it for your own use by inspecting the code. Again, it is the Execute function of the dialogue that is vital. The Date property is of type TDateTime, so we convert it to a string before displaying it in a label. 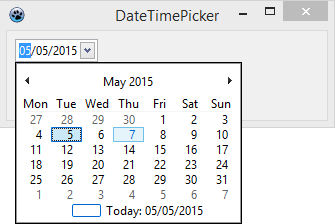 See the section below for a demonstration of the DateTimePicker, which you might use instead of a CalendarDialog. The TDateTimePicker control was introduced in Lazarus 1.4. We added to a form a TDateTimePicker (Common Controls tab) and two labels, which we named lblDate and lblRelative. Double clicking in the edit box for the OnChange event of DateTimePicker1 in the Object Inspector gave the automatically generated empty procedure DateTimePicker1Change in the editor with the cursor positioned for the typing of the procedure body. The first screenshot shows the date selection and the second shows the output.